It is my birthday on Friday and I am most definitely feeling my age, even though it will be another three years before I qualify for a bus pass. No, make that seven years. Because I have just checked the Government’s online ready reckoner of my entitlements, which increasingly resemble one of those carrots suspended in front of a donkey on a long stick. This seems odd, given that railway booking clerks have been raising their voices and enunciating “Have you got a railcard?” with painful clarity for at least a decade now. The last such encounter was on the Welsh Highland Railway a couple of weeks ago, when the conductor offered us “two seniors and an adult” after apparently mistaking me for the husband of my 86-year-old aunt. You might think it foolish to make a fuss, but the railway proved to have the unusual policy of charging more for its concessionary fares than for the ordinary ones. So I was moderately cheered until we reached the terminus and I took my small son into the gift shop, where the bloke behind the counter immediately addressed me as “Granddad”. At least there is the chance that I may be gloriously Raptured on Harold Camping’s revised date of October 21 this year, or when the Mayan calendar runs out on December 21, 2012. Or there is the long-standing prediction by deathclock.com that I will be handing in my dinner pail on February 4, 2012, though the credibility of this received a severe knock when my brother took the self-same test and it told him that he had been dead for a decade already. But what of the alternative of getting seriously old, as opposed to just looking it as I evidently do? 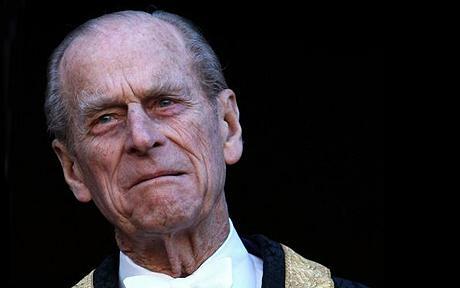 Could there be a finer role model for any of us than HRH The Duke of Edinburgh, 90 on June 10, who just keeps beggaring on, as Churchill almost put it? One week it’s the State Visit to Ireland, the next it’s the Obamas in London. Both fraught with a huge range of risks, not least the potential for some mind-bogglingly inappropriate asides, yet both adjudged diplomatic triumphs. One of the very few bits of television I watched last week was Alan Titchmarsh’s epic interview with the Duke, which had clearly been edited to eliminate HRH’s initial reply to each of the timid gardener’s queries: “What a blanking stupid question!” It was like watching a crocodile toy with a chihuahua. How much more fun it would be to let His Royal Highness loose on a Paxman or a Humphrys, and see these legendarily tough interviewers being tossed, gored and trampled by a man who truly has nothing to gain by winning them over. And who apparently cares so little for his own reputation that even when presented with an open goal – the chance to take credit for a genuinely great innovation, The Duke of Edinburgh’s Award – modestly snapped that he had merely lent it his name. I have a friend who repeatedly asserts that there is no such thing as a happy 90-year-old (readers please feel free to correct him). And on the evidence of Alan Titchmarsh’s cringeworthy efforts, there is probably no right thing to say to Prince Philip. Nevertheless I wish him a very happy birthday, and many more. Like the Royal Yacht, he is a unique asset who will be sorely missed when he is gone. Try the Death Test as opposed to the Death Clock... not only will you get a new, refreshed date of expiring, but it will tell you how you'll do it (mine's alien abduction, so I am convinced of its accuracy). Tbanks for that tip. I found that I could not follow the link you suggested without handing over huge amounts of personal information, including my bank sort code, account number and PIN, but I went to a more or less identically named site which claimed some no doubt spurious association with Harvard [almost certainly no relation to the university of the same name]. This informed me that I would die of a heart attack in September 2035, aged 81. Which sounded partly plausible. The heart attack bit, that is. I can picture my cardiologist nodding his head. However, on closer examination it did not say 'in September 2035' but 'BY September 2035'. Like those offers to 'save UP TO £1,000' (which clearly includes £0) it leaves open the possibility that I will indeed expire in February 2012. If not sooner.